AS WE SHOWED earlier today, Novell and the Linux Foundation are not totally separate. Another thing they have in common is that they both feed IDC|IDG, which is the the Fox 'News' of technology. This establishment is interested in making money, not in informing. In other words, those who are willing to pay also make the news. It is important to stop this cycle that’s dominated by exchange of money because it voids trust and deceives innocent consumers (derogatory term for customers). The Linux Foundation, however, repeats its sins from last year because it fights fire with fire by paying IDC. And yes, it’s Al Gillen again. It is the man who attacks GNU/Linux when someone else pays his wage. This was explained a year ago and the same rebuttal still applies, so last year’s lengthy argument needn’t be repeated really. Here is coverage of the report which the Linux Foundation bought. With all that goes on at conferences, it would seem that a white paper presentation would be, invariably, a pretty dry event — with the document itself being even drier. While there are many topics in the Linux Foundation-sponsored IDC white paper, “The Opportunity for Linux in a New Economy” (linked here as a PDF), and one might choose to quickly skim the research, data and projections, this report is really well worth taking a close look through. Linux advocates, such as Red Hat CEO Jim Whitehurst, are fond of saying the open source operating system will thrive in a downturn. IDC analyst Al Gillen went a step further Wednesday, saying Linux revenue growth will seem less than spectacular during the downturn because much of its increased use will take place as free guests running on virtualized servers. There are other (sometimes former) IDC people who attack Microsoft’s competition and one example is Dennis Byron, who cites his old employer when Novell feeds IDC to promote itself. It is important to clarify all this because we showed antitrust exhibits which expose corruption. IDC analysts are being receptive of whoever pays the most money and often that is Microsoft [1, 2, 3, 4, 5]. The IDC findings do not conflict with a recent Novell-sponsored IDC report that said the down economy was driving an uptick in Linux evaluation, Eastwood said. “In the short term, Linux is down as is Windows. But over time, we believe Linux will continue to grow,” as will Windows, he said. There is also this from a few days ago. Last month, a study by IDC for Novell revealed that over half of IT executives are looking to make use of Linux servers for web hosting and other purposes during the recession. When will Novell and the Linux Foundation realise that they validate the very same FUD that is used against them by throwing money at its very source? The only one gaining from all this attention (and money) is the shill-for-hire. “The only one gaining from all this attention (and money) is the shill-for-hire.”There may actually be more to this story about IDC. Balrog, a Boycott Novell regular, says that “Microsoft is heavily attacking Apple even though there’s not too much basis in their attacks.” He shows this latest provocation from Microsoft’s main PR person in CNET (which as a network is pretty close to Microsoft too). “Who did Microsoft pay,” we inquired because we know for a verifiable fact that Microsoft offers a lot of money for Mac bloggers to attack Apple. “They’re doing some weird things, like including Apple’s MobileMe service for the Mac while not providing an equivalent for PC,” argues Balrog. Microsoft is not so tactless when it comes to FUD. Its people always pretend not to attack with FUD; They hire a shill instead and there are many prior examples, including recent ones. According to Microsoft's close friend Shane O'Neill, “Unusually, Kay and Microsoft also choose to sidestep Apple’s higher-end iMacs altogether and try to equate a Mac Pro with a HP Pavilion desktop; according to the paper, a modern Xeon workstation is feature-equivalent to a mid-range home system with a previous-generation Core 2 Quad processor and slower graphics.” It’s fascinating how they all cite one another. It’s a pattern of behaviour that was identified in other Web sites too, e.g. when it comes to Rob Enderle and Dan Lyons attacking Linux using SCO. They seed one another and manufacture evidence the Microsoft way. Here is where IDC comes into this picture. It’s to do with the guy behind the original report. The guy “labeled Microsoft’s PDL ‘a PDF killer’ back in 05,” Balrog has discovered. “Officially unveiled as part of Microsoft Chairman Bill Gates’ kick-off keynote, the new Microsoft document workflow format, code-named “Metro,” sounds from initial explanations like a page-description language meant to compete with Adobe’s PostScript and PDF technologies,” claims the article from Mary Jo Foley. And that’s the point where the coin slips in. He worked for IDC at the time. He was attacking PDF, which it at no real risk 4 years down the line (the article is from April 2005). 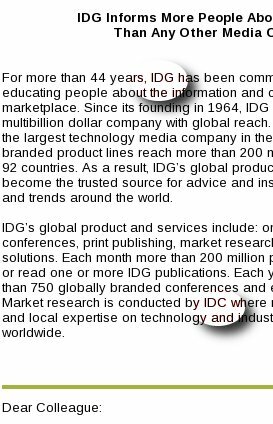 Yes, that sure sounds like skills one would acquire at IDC (International Data Corp.). “He has his own company now,” says Balrog . “He’s president of Endpoint Technology Associates. He was writing nonsense about Mac and iPhone viruses / ‘security’ before.” The article is nowhere other than the ‘Wintel’ press. So, credit goes to our reader Balrog and we are hoping to find more through our reader Goblin, who is keeping track of others who are serving Microsoft in disguise. How to promote Microsoft – The CC.Torment way! I have alot of time for users with honest held belief and an open mind to alternatives. One such site and user is the owner of the WindowsObserver website. A very nice chap, who supports Microsoft products and has good reasons for him doing so. Then we come to more odious individuals, who for reasons you can decide for yourself have other motives for supporting Microsoft and attempting (badly) to cheapen alternatives. In followup to the CC.Torment article, it is alleged that Andre Da Costa is actually CC.Torment (unconfirmed) and another foul mouthed pro MS supporter called Dr Dee. This has yet to be confirmed, although any user checking over on Microsoft Watch will have a little chuckle when they see a post by another regular MS supporter who appeared to forget hes posting under his “Nknow” handle and responds to a question aimed at CC.Torment using the same style and wording. If it wasnt such a serious business you could laugh at the incompetence of a MS promoter who gets in a muddle with his own sock puppets. Ive had another pleasant surprise with the Windows7themes site, whilst this site is obviously aimed at Windows the owner is more than happy to not only allow alternative opinion, but states that he will be giving Linux a try. For me the “battle” is about not forcing any user down any particular route but informing them of all alternatives so that they can make an informed decision on the basis of reasoned debate and honest held belief. If I recall this correctly, “Dr Dee.” is very active in CNET/ZDNet, where Microsoft is known to be sending its employees to comment (spin), as revealed by Wired Magazine.